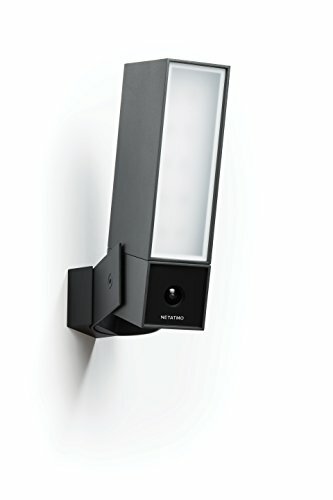 The Netatmo Presence has been out for a few years now, making Netatmo well ahead of the curve for wired outdoor surveillance cameras with a floodlight. It is only the past year or so that we have seen options from Ring, Arlo and Yale offering similar functionality. Similar to their indoor Welcome camera, the Presence has several unique features that differentiate it from the pack. This has smart detection which will distinguish between people, animals and cars, and there is no cloud service, everything is stored locally. This means no monthly charges and fewer privacy concerns. It is currently priced at £225.00 on Amazon and has 169 reviews giving it a very positive score of 4/5. not offer always-on floodlights, and will require regular charging. too difficult for my liking. If you are a skilled DIYer, then there is nothing technically complicated about installing this, but for most people, I would strongly recommend an electrician. The installation video makes things look very easy. secure design, but once set up there is little to no movement. Partly due to my poor DIY skills, but also the design, the plastic housing doesn’t fit 100% flush with the wall, even if it does, it won’t be weatherproof, so you need to seal the edges between the wall and housing. In my case, I had no back box built into the wall, so there was less room for wires, I am probably going to get it redone by someone that knows what they are doing. camera a QR code, which will then restart the set-up process. warned every time someone walked past. car, but ignore animals or other motion. In the past few weeks, I have used this, it has worked very well. Due to the number of cameras I review, I currently have three trained on my front door, the Ring Doorbell, Eufy E and now the Netatmo. you could only just see their head. When Presence does detect someone, the app saves thumbnail images of the person so you can have an overview of who has been at your house. I have static IP CCTV cameras too, and I like that this gives me time stamps, so if something is identified, I can quickly pull up my 24/7 footage without spending ages looking through video. In the Netatmo app, you can click on the images and this will allow you to either stream the recorded footage or download it to your phone. have on any future releases. to wind moving branches or other objects. Connecting to the camera and downloading footage has been reliable, but the downloading things can be a little slow. It connects to using Wi-Fi 802.11 b/g/n (2.4GHz) which is good for range but poor for speeds. Considering this is wired and reasonably expensive I would have liked Wi-Fi 802.11 ac which is considerably less congested. notifications due to getting pestered every time the wind picks up. I have limited experience with wired cameras, with the Yale Smart Living All in One Outdoor Camera being the only other one I have done. They are quite different products too, the Yale is extremely easy to install as long as you can find a way to route the cable into your house, however, it lacks the intelligent features of this, and its floodlight is nowhere near as powerful. initially, but should work out cheaper in the long term.